I would say that has been done in this regard in the last ten years in the industry a lot. Just look only how many openly gay actors in the "Hobbit" with were: two of the dwarves, to Luke Evans, Stephen Fry, Lee Pace. 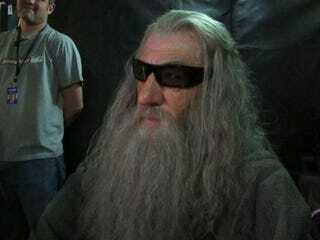 In "The Lord of the Rings" I was the only one next to it there was my make-up artist and one from the wardrobe team. That's only once a progress, right? The trouble is that of the five people mentioned, only two are openly gay: Adam Brown (one of the dwarves) and Stephen Fry. Luke Evans was openly gay a few years ago, but as his star began to rise he and his agent have called for "privacy," and interviews with Evans discussing his sexuality have magically disappeared from the net. Lee Pace has never "come out," but he has been in a glass closet of sorts for a while. That still leaves people to wonder who the second dwarf is — Richard Armitage has been mentioned, but wasn't confirmed or named by McKellen. Now I don't want to come down on McKellen for "outing" a handful of actors who are not, in fact, openly gay in their professional lives. It's entirely possible that he had no idea that they hadn't come out publicly. That said, public outings tend to be really messy — especially when they're done by a third party. There are larger questions, like why this interview is only making the rounds now, for instance, which seems a bit odd. But what really bothers me about this is that I think sexuality is a nebulous and changing thing and doesn't need to either be Column A or Column B. There's something about an "outing" that suggests that we're asking someone to firmly place themselves in a box and never have a more complex self-identity than who they regularly sleep with or want to sleep with. And then there's the smugness of, "Ah, I always knew he was gay. Who was he kidding?" If it's not appropriate for someone to have to come out in a regular office workplace, how is it appropriate to demand it of them as an actor or public figure? Then again, I completely understand the need for young people struggling with their sexuality to have proud and openly gay figures to look up to. While he's not without faults, I think Neil Patrick Harris has done a lot for that kind of positive visibility. Long story short — it's a very complex issue, one that makes me feel enormously conflicted and I worry about how the media will handle this.